No doubt you may have seen the following video circulating around social media recently. A Christian fundamentalist named Megan Fox – a self-proclaimed specialist in “exposing” liberals and scientists (apparently the two are one and the same – her first mistake) as frauds, has decided to take what was possibly her first and only trip to a museum to uncover what she feels to be the Science Agenda. Chicago’s Field Museum of Natural History was her target of choice. Armed with a video camera and an unhealthy dose of scientific illiteracy – Megan Fox attempts to understand the ways of the science world and fails miserably. From her YouTube Channel: “In November 2014, Megan Fox toured the Field Museum’s “Evolving Earth” exhibit to audit it for bias. She found many examples of inconsistencies and the Field Museum’s insistence that people support opinion as fact without proof. The Field Museum pushes certain theories as if they are absolute proven law when that is not how the scientific method works. She found enough bias to show that the people who put this exhibit together at the Field Museum pushed an agenda with quasi-religious overtones: the cult of “science” where the “scientists” are more like high priests pushing a religion instead of using the correct scientific method. Aside from having time machines, there is no way these people can be this certain about things they speculate happened millions of years ago before recorded history“. I felt the need to write an open letter to Miss Fox after viewing the video and creating a nice little dent in my desk from where my head was hitting it so often. I was recently introduced to your video when it was posted in Facebook group and I feel the need to clear up some misconceptions you have in regards to science and the scientific community. While I understand your curiosity as to all things science which I assume is a product of your fundamentalist Christian background, there are a few things you should understand before entering into a museum and making judgements as to the role of science in the education of children. 1. The God of the Gaps argument is a logical fallacy of which the Burden of Proof lies with you. Throughout the video you stated that you didn’t understand the concepts that were presented to you. I can tell that you have a very poor (if any at all) understanding of how evolution, chemistry, biology and physics works. I don’t blame you for being confused and angry at concepts you don’t understand, science is a vast field consisting of many sub-fields. The science community is made up of many specialities each requiring years of training to get the relevant qualifications to work in an individual’s chosen field. This is what I feel you were trying to say. Please prove me incorrectThe God of the Gaps argument is an argument that is employed by theists when they don’t understand something – when there is gaps in their knowledge. Essentially it boils down to “I don’t know therefore god did it”. This is what you would refer to as “muddled thinking”. Firstly to use this argument, as a theist you would need to prove that your god 1) exists, 2) is the Christian god oppose to the other gods and goddesses worshipped. There have been thousands of gods and faiths worshipped over the courses of human history – how do you know yours is the correct one? or even if your god exists? I’m sorry but one book stating that god exists which is backed up by elected authority figures of one of several monotheistic religions saying “Trust me, have faith” does not inspire confidence in me. Faith is certainty without evidence. It is the end of questioning. 2. Science does not have all the answers, there are some questions science cannot answer but that does not give legitimacy to any religion or any faith nor does it mean that faith can fill the holes in science with unprovable concepts. This refers back to the God of the Gaps argument. Science cannot answer some questions – science explains to us the “why” things work and “how” things work, it doesn’t explain to us in what way we should use them. That is up to the person. Science is simply a method for understanding the world using the process of the scientific method in an impartial way. 3. Unlike religion, science does not need belief. The word “believe” has no place in science. It has a place in religion where belief equals faith which equals certainty without evidence. To believe or have faith is to accept as true without evidence. Science doesn’t require faith. Medicine that has been rigorously tested and proven to be effective, doesn’t require belief. You don’t need to believe that stitching a wound shut will help the healing process. You don’t need to believe that CPR is a proven method for helping someone. We don’t need to believe in evolution – we have evidence, carbon and radiometric dating that supports why we should accept the premise of evolution and when new evidence is found – we will update our knowledge. A person does not need to believe without evidence or have faith in gravity or physics, science does not need to threaten pain or death or the concept of hell if we don’t accept what it tells us. If we have questions we want answered, science allows us to go seek those answers. Science is self-correcting, if new information is found that renders old information obsolete – science gives us the freedom to correct those mistakes and update our knowledge to something better. Where religion discourages you to question, science will always have that as an option. Science is ever changing, it adapts to new information to improve and/or expand ideas. 4. Science starts with observation. This is what research is for. Scientific hypothesise are created by first observing the world around us, that observation is then put to the test by designing a high quality study (either qualitative or a quantitative study) to see how that observation holds up against scrutiny. We gather data and come to a conclusion. We design the experiment to reduce bias and be as impartial as possible and follow the data. Once we have data, we reach a conclusion. If the conclusion we reach based on the data gathered does not support the initial hypothesis – we change our hypothesis. Those results are than challenged by our peers in the peer review process. We tear the conclusion apart to look for bias and inconsistencies and welcome criticism. The results are often tested again to see whether they have the means to be replicated. Science does not care whether you accept it or not, it has a process to find the most accurate information in the most impartial way. Religion works in the opposite direction. Religion starts with a conclusion and creates data to suit that conclusion and when the conclusion is challenged, it is often met with defensive tactics such as “Playing the Magic Card”, “Moving the Goalposts” and accusations of persecution or violence. Religion has attempted to set itself up as a movement exempt from criticism. Nothing should ever be exempt from criticism. Religion is rigid, it begins with a story which consists of assertions from a guidebook that has no evidence to back it up and no way to test the assertions it makes. It continues with insistence that those assertions have merit without any evidence. In places all over the world that insistence is displayed by brute force and violence. Conversion or death is not unheard of. Faith is simply hope under the guise of certainty, the arrogance of theists to think they are correct and the ignorance and lack of training to examine why they believe in the first place. Faith believes everything and requires proof of nothing. It attempts to explain everything while explaining nothing at all. This is the difference between science and faithFaith is a closed system where “the will of god, “god did it” and “have faith” are the answers to every question. Faith does not add to human knowledge or freedom; more often it oppresses it, all in the name of the unprovable concept of a higher power. Faith and religion must stop the progression of humanity in order to survive. I understand that you did not enter into the museum with the agenda to learn but with the agenda to “out” science as a tool to indoctrinate young minds into things you don’t understand. In the end I found your video to be the ultimate form of irony – a heavily indoctrinated fundamentalist Christian promoting the idea that science is an indoctrinating mind control device used to seduce our children. What exactly are we seducing children into? Understanding chemistry so the future chemists of the world can create medications to help sick people? Understanding physics and engineering to create technology such as better computers, better medical equipment and shuttles to explore space? Are we seducing children to become future biologists that can give us a greater understanding of the world around us in terms of both non-human and human biology? Are we seducing children to become the researchers of tomorrow that may one day find the cure for cancer? I fail to understand why teaching children these concepts so they can aspire to achievements just like the researchers of the past who discovered aspirin, created vaccines against polio and have devised ways to help people to walk again after accidents, I fail to understand why you are threatened by this. You walked into the Chicago’s Field Museum of Natural History with an agenda to uncover a plot that you feel would shake the foundations of the planet. Well you have and it has been in front of you the entire time. The science agenda is to educate people into becoming more scientifically literate to advance our society. We want to create a better future for our children, with better medical technology and a greater understanding of the world. You have a distaste for science yet you record that distaste on a video recorder that science built. You drove to the museum in a car that science built and uploaded your video onto the Internet via a computer – both things science built. Did I mention that an atheists created the concept of a computer? If you want science to stop doing what it does, we can but it will mean you need to stop using electricity and cars and medicine. You can grow your own food but you can’t use irrigation to help water them nor any gardening chemicals to help them grow and be protected from pests. You can attempt to make shelter but you may need the knowledge of math and engineering to do so and completely forgot about using washing machines to wash your clothes and soap to clean yourself with. Chemists helped build those. The Science Agenda is about leaving behind a better future for our children. 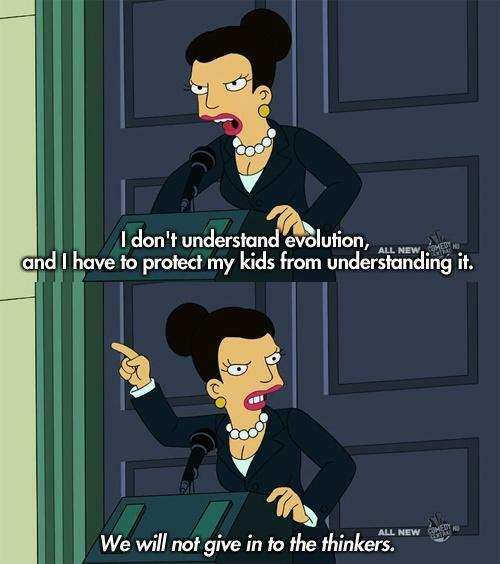 So to Miss Fox who has a distaste for science and a love of her god, well done to you. I applaud you. In the 30 minutes you ventured into the museum you have successfully shown the world why it is absolutely necessary to continue science education and why being literate in science is vital to the continuation of our species.